I cleaned my friends PT Cruiser yesterday.... They apparently never wash it. Honestly I was still having a little of a hard time on the rims and I used some Megs APC and CG Diablo Gel. Had to go over them quite a bit since there was so much build up. Used Ultima and a rinsless wash. Took so long I still havent got to polish it out to remove as much scratches as I can. Ill have to finish it up next weekend when we have more time. So these pics are just after a MUCH needed wash and clay session. I did get to polish the hood out just to see what I would be working with. Here are some pics I took. Had the day off yesterday so decided to try for a second time on a rinseless wash. I stopped by the car wash before I left town a couple days earlier and hosed off the major road grime and car had not been driven before the rinseless. Used DPRW&G last time and not sure I liked it so bought some BFRW on the Black Friday special and gave that a try. Being only my second time using rinseless I used 2BM, 2 MF towels one for first pass and the 2nd towel for the 2nd pass rinsing both between panels. Dried each panel as I went and called it a day when I finished. Today I decided to try out the can of Surf City Garage Carnuba paste wax that I picked up at Walmart. I applied but of course being cold here I had to warm the garage up but with the surface temp of the car being cold it just didn`t want to haze over very well. It is only 12F here outside and it takes a while to get the garage up to around the 60 mark so it didn`t seem to want to fully cure. Stuff left a nice shine and think it would improve with higher temps. I have used SCG this past summer since I had won a sampler of their products, used a little bit of them but gave it away to a woman at work that needed some detailing items for her Mustang. I still am really not sure I like the rinseless wash thing since it seems like it leaves a film behind in places, which is the reason I tried BFRW but got similar results. First time I used 1 MFWW I picked up another and used the 2nd one for final drying pass. Maybe with practice I or it will get better. Have you tried the Garry Dean Method? I tried out a few new products. I tried used Ultima Interior cleaning gel and Interior Guard. Normally I`ve used DP interior cleaner and 303 or Meg`s QID. I think I like the smell of Ultima gel a little better than DP. It cleaned really well and the interior guard left a nice natural finish. It darkened the black trim a little but it was subtle and not glossy. First and most important. I did all my Christmas shopping in under 2 hours from when I left till when I was home.... WINNER !!!! I also managed to do a mini detail on my car. CG Stripper Scent .... Yum !!! Showed a coworker how their car would look cleaned up. No I have not. What is the Garry Dean Method? A search didn`t find anything. Yesterday: Decided I was tired of the Cquartz/Reload on the Tiburon. A year of daily driving added its share of RIDS & just plain scratches and, while looking great to "normal" folk, just wasn`t doing it for me anymore. Polished it mostly with Flex 3401 + 5" LC Hybrid White + M205 with some Metabo + 4" LC CCS Black + M205 in tight areas & PCXP + 5" Megs Cutting MF + D300 for deeper stuff. Finish polished/prep`ed with Wolf`s Shine & Seal on Flex 3401 + 5" LC CCS Green. LSP was Wolf`s Hard Body applied with GG6 + 6" LC Flat Blue. Awesome would be an understatement. Also, the 2013 Estoril Blue BMW 335i showed up for a little WETS on the rubber trim around the windows (prep`ed with OPC & IPA). These areas seem to soak in everything and get mottled looking. Today: Jambs with CG EcoSmart Waterless plus vacuum and interior wipe down of the Tiburon with UWW+. Will also likely wash the Sonata later. I don`t know if this counts as "detailing" but it involves detailing supplies. I put up a shelf to hold some stuff. 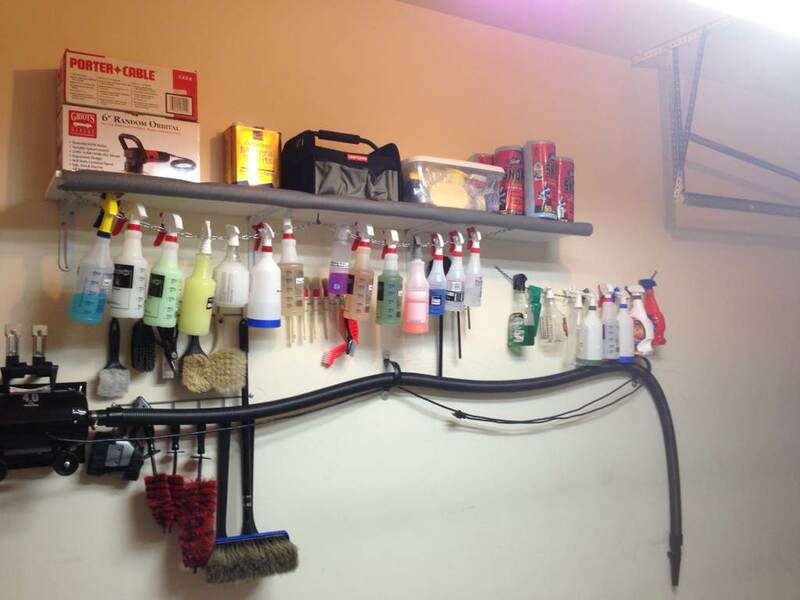 Then I got an idea, and put up chain that I had laying around the garage for spray bottles. For some this is no big deal. 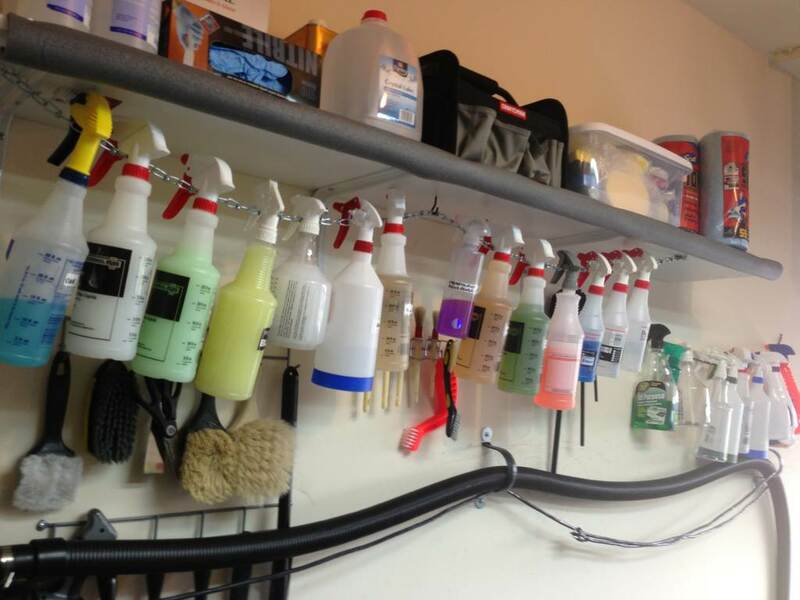 But when you only have a narrow single car garage and a lot of detailing chemicals, a pressure washer, mechanics tools, and 4 tubs of microfibers, anything that creatively uses space is awesome. Now I have more room to buy more stuff. Yesterday, I cleaned the interior of my MKZ daily driver...now over 65K miles. After vacuuming with the Metro, I clean the interior with 1z Cockpit Premium. I used a newly purchased version with a new sprayer (previous version was more than 3 yrs old). It also smelled a little bit differently (better) with a more citrus scent but not as "zesty" as the older one. I also cleaned the floor matts with CG NONSENsE full strength (said dilute 20:1). I will have to test this more later. I then applied Blackfire Protectant on the plastics. It is white with a medium consistency and spread very evenly and buffed down well. I apply to applicator then spread. On the front leather seats, I cleaned then with Four Star Leather Cleaner and applied Leather Masters Protection Cream. I need to finish up the glass today. not really feeling well (all fricken week) but wanted to get outside and do the xterra. mid 40`s. tried megs APC+ mixed 10:1 on the wheels & tires. well, quite impressed. it did a fine and safe job. i might up the mix in the future. but wanted to try it out as my new decitated wheel & tire cleaner. this is going to save $ instead of buying single wheel & tire cleaners. and finished up with a wipedown of BF POLYMER SPRAY. for someone who never gets sick, hope i kick this *itch soon! !